The President Cancer’s Panel urges you to filter your home’s water. 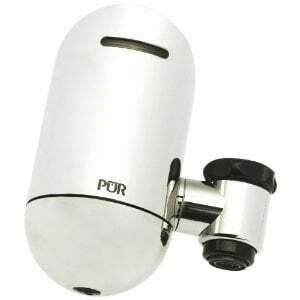 This PUR Faucet Filter is a Consumer Report’s Best Buy. We wrote about the President’s Cancer Panel‘s report back in May. The 240-page report listed several different contaminants, and explained how they could enter not only our water, but also our air and soil as well. As Laliberte points out, the Cancer Panel recommends that you filter your tap water at home with a faucet water filter. The use of reusable water bottles to carry this water with you, such as the Klean Kanteen Stainless Steel Water Bottle, is also advised. We carry the three� faucet filters recommended by Consumer Reports that Laliberte mentions in the MSNBC article. The Culligan FM-15A Faucet Filter and PUR FM-3700 Faucet Filter were named best buys by Consumer Reports. The Brita OPFF-100 (also known as the Brita On Tap Faucet Filter) is also one of our more popular faucet water filters. Most tap faucet filters install with little to no tools. Installing a water faucet filter is one of the easiest ways to filter your home’s drinking water. Be sure to read the rest of the article for a dozen more ways to avoid cancer!